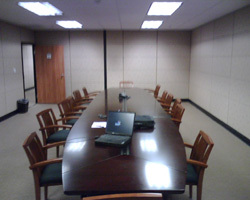 This TO&A conference suite is located in the Broadway center at the intersection of 16th and Broadway in downtown Denver, Colorado. Positioned on top of the famous 16th Street Mall, we are convenient to courthouses and just a short walk from major transportation. Our well-furnished deposition suites provide state of the art audio/visual technology and our friendly and professional staff is on hand to handle all your needs. TO&A can provide all your deposition needs from court reporters, interpreting, and videography.